Andrea Moda Formula was a Formula One team, created by Andrea Sassetti, a shoe manufacturer from Italy. In September 1991 he bought the Coloni F1 team after Pedro Chaves had failed to pre-qualify a car for every single race that year. Roberto Moreno in the Andrea Moda S921, at the 1992 Monaco Grand Prix. 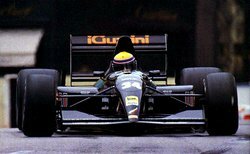 The team hired a number of ex-Coloni staff and did a deal with Simtek to run a car which had been designed in 1990 for BMW. This was fitted with Judd V10 engines but the cars were not ready for the start of the season in South Africa and Sassetti arrived with old Coloni chassis for drivers Alex Caffi and Enrico Bertaggia. The team was excluded from the event for not having paid the $100,000 deposit for new teams in the World Championship, Sassetti arguing that it was not a new team. In Mexico the team arrived with all its equipment but the cars were still being built and neither ran. At the San Marino Grand Prix, Roberto Moreno and Perry McCarthy were nominated as the drivers but McCarthy was refused a superlicence and Moreno failed to qualify. It was not until Monaco that Moreno managed to get a car into the race, only to retire early on because of an engine problem. In Canada the team was without engines because Sassetti had failed to pay Judd. Many people had left the team by this stage and the operation missed the French Grand Prix because its truck was stuck in one of the blockades by French truck drivers. Moreno and McCarthy battled on but failed to pre-qualify for the races that summer and in August the team was warned by the FIA that it faced exclusion from the World Championship if it did not improve. At the Belgian Grand Prix, Sassetti was arrested in the paddock for allegedly forging invoices and when the team showed up at Monza for the Italian Grand Prix in September it was turned away from the paddock, the FIA having excluded the team from the series for bringing the sport into disrepute.